Festival season is only round the corner, and with it brings whole host of fashion trends that are set to be popular throughout the next few months. From the hugely popular UK festivals like V Festival, Leeds and Reading, to those more exotic options such as Hideout in Croatia, fashion is a huge part of it all. Festival fashion gives you a little more room for creativity, allowing to take a quirky approach to your style. Showing off unique character, a festival collection should be bright, bold and adventurous. Come rain or shine, festival fashion powers on and allows those attending to stand out from the crowd for all the right reasons. Building the perfect festival collection may not be easy, but always looks impressive when it’s complete. Including vibrant prints and other popular styles such as Bardot, festivals quickly become somewhat of a fashion show. So, if you need those must-have pieces to complete your collection, take note of these popular styles. Encouraging versatility no matter what the weather, festival fashion at times can sometimes take an edgy stance. Mesh has become a popular trend in recent times, offering something different and eye-catching. Perfect for layering, which comes in handy at any festival, mesh tops look great over ripped jeans or even a dress for a unique look. Mesh is a flexible material to work with; it can be incorporated into any number of garments and adds an alternative option to your collection. Different from the usual prints or materials such as lace and chiffon that are often go-to’s for this time of year, a mesh top is a style that can transcend the seasons. No festival collection is complete without vibrant, bold prints that scream summer. Prints come into their own when it comes to festivals. A popular choice to brighten up even the wettest of weather, printed tops, dresses and playsuits can be seen everywhere and are a definite must-have. Tropical print, such as palm trees or tropical flowers, has become a prevalent design, offering something different to the usual floral print. However, floral print is back in full force too; including large, bold flowers to smaller, more feminine options. Allowing you to broaden your collection, bright prints encompass a whole host of different designs. Abstract prints and paisley can also add a more exciting element to your festival collection. A trend that emerged some time ago, and is still going strong, is the cold shoulder. 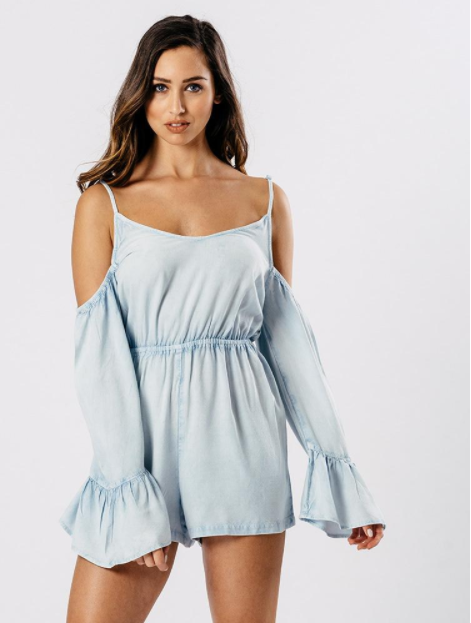 Not only is this perfect for all weather, the cold shoulder lends itself to the likes of cami tops and playsuits. Updating already well-known styles, the cold shoulder offers a twist on classic designs. With summery colours and materials to work with, the cold shoulder top is almost a fashion staple now and is found across a lot of summer trends. When it comes to building your dream festival collection for this year, these must-have pieces should make a definite appearance!